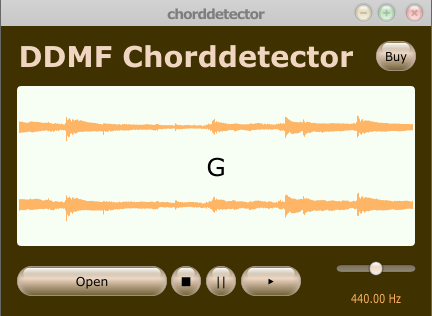 There are geniuses that can determine a chord in a snap just by natural talent - via ear training, then there are the techie people that will use tools to get the same effect - via chord detection software like Chord Detector. Just load the song that you want to learn the chords from, press play then the chords will be displayed in real time. The technology behind Chord Detector is described as a program that watches a set of virtual strings vibrate in response to real-time audio frequencies, then it makes chord suggestions based on the vibrations. This is designed to help musicians easily learn the chords of a song. Posted by Anonymous on Tue, 02/19/2013 - 23:04. The best recognition from the 3 different SWs I have tried so far. It playes the songs, too. Posted by Anonymous on Mon, 03/23/2015 - 06:34. Does not do anything after I 'open' a MP3 file into the interface. Will not play or show chords or anything. I am running Windows Vista and this program is a no-go for me. I tried 4 different music selections and nothing. How disappointing. Posted by Anonymous on Fri, 05/31/2013 - 16:04. Posted by Anonymous on Sat, 02/02/2013 - 13:17.